Product User Registration - NOISE LABORATORY CO.,LTD. Thank you very much for purchasing our products. Customers who complete "Product User Registration" receive the latest news on our new products and support information and others. Once user registration is completed, registered user receives the "Customer Numbers" by return. Please inform us of your customer number whenever you contact us in future. Once user registration is completed, registered user receives "Contact Information" for your inquiries in your country. Please feel free to make inquiries about our products and service support. (1) Please fill in all fields with * mark. 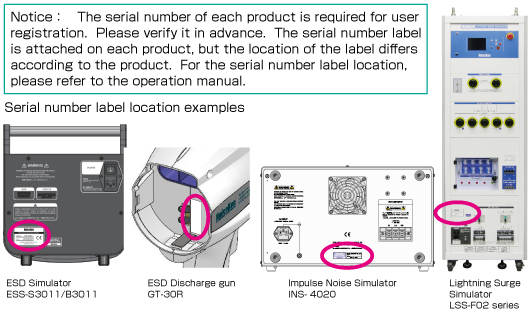 (2) You can resister up to 5 serial numbers. When you resister more than 6 serial numbers, please fill in model names and serial number in "Your comment and request" box. Date of purchase * Please select an item in a drop-down box. (Notice) When you can not find your model on the list below, plase fill in the model names and serial numbers in "Your comment and request" box. Your comments or request Please write your inquiry as specific as possible. Thank you very much for your filling out this form.